If David Montgomery is looking for an exemplary model for his new regional empire, he could do no better than pick up a copy of the Tamworth Herald. In the Thursday 6 December edition of the former Northcliffe weekly, there were no fewer than 290 stories on 52 news and features pages, with another 100+ reports on 13 sports pages, and a 32-page Homes pull-out. And every single story and picture in the 136 pages, plus the vast majority of adverts, were local. 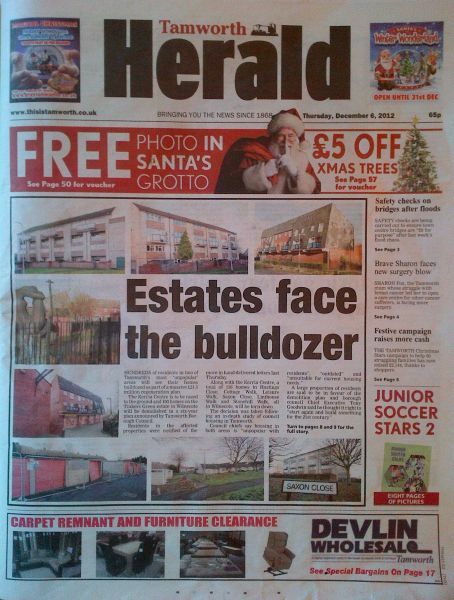 ‘Estates face the bulldozer’ was the splash, decently designed with eight pictures of the problem council estates in the town that are to be demolished. This would have been a good eye-grabber for anyone in Tamworth – because they lived on one of the estates, were related to or knew someone who was, or simply agreed that the “notorious, unpopular and outdated” homes should be flattened. The splash was a tightly-written seven pars, and this then turned to a detailed 42-paragraph backgrounder on pages eight and nine, with an informative panel answering ten questions on ‘The facts behind giant plan’, and another listing the ‘Properties to be demolished’. What I especially liked about the Herald was the presence of so many painstakingly assembled sections that provided a really interesting, consistent package for readers. Take the letters pages – all four of them from page 10 to 13, with catchy headlines such as ‘Helping hand for super Tilly’, ‘New exit is dangerous’ and ‘Scrap dealers too insistent’, as well as ‘The gallery’ for a reader’s autumn picture and a ‘Poets corner’, both often local favourites. Next up came the ‘Looking back’ nostalgia section, from page 14 to 17, containing a fascinating feature on ‘The lost snack bars and cafés of old Tamworth’, with seven pictures of the various places many Herald readers frequented during the 1950s and 60s. The first nostalgia spread also carried three columns of ‘From the Herald files’ of 25 years, 50 years and 100 years ago, a feature that is hard work to compile but makes such a great read. The second nostalgia spread then depicted a total of nine ‘Pictures from the past’ depicting floods in and around the town from 1912, 1931, 1932, 1959, 1960 and 2007. This was a cleverly planned follow up from the floods reported in the previous week’s Herald, which had splashed on ‘Swamped’ views from the sky as reported on Holdthefrontpage ; another five aerial pictures of the town’s landmarks filled page 36. ‘Village voice’ on pages 46 and 47, with a total of 55 stories from surrounding villages. The efforts of the Herald’s sports team was also noteworthy, with three comprehensive pages on Tamworth FC in the Blue Square Premier League, including a gripping report on ‘The Lambs’ 3-2 victory over Dartford when former Premier League star Lee Hendrie netted an 88th minute winner. But while the big club provided a focus, the sports pages also carried detailed coverage of local angling, martial arts, table tennis, American football, gymnastics, athletics, golf, swimming, hockey and rugby. And there was an eight-page ‘Junior Soccer Stars’ pull-out displaying 37 team line ups of enthusiastic kids aged from under-15 to under-7. Back in news, strong early page leads included ‘Toxic gas fears’ on page two, ‘Safety checks on bridges after floods’ on page three, a grim river search for a missing pensioner on page five and a drink-drive ban for a local surveyor after a motorway crash on page seven. The quality didn’t drop deeper in the paper, with a full half-page on the early death of former soccer star Steve Fox on page 31, a fight against the HS2 high-speed train plans on page 41 and a report on a heavily pregnant shoplifter on page 49. The 65p Herald, which sells an average of 18,394 copies a week according to the latest ABCs, looks, feels and reads like a quality local weekly should, and editor Gary Phelps deserves high praise for what he and his tight staff produce here and at related sister weeklies in Lichfield, Walsall Observer, Great Barr and Sutton Coldfield. As the new Local World operation begins its work from January, I fully expect to see the strength of the Herald at least maintained and ideally held up as best practice by Monty and his crew. I live in the vicinity of Tamworth and the Herald is one of the strongest weekly papers in the area. Deserved praise. I enjoy reading these reviews and it’s good to see Steve noting the cover price and ABC sale. I wonder if there could also be some commentary on the recent sales trend? It would be fascinating to see if the better performing titles are also those that Steve rates highly in his critique. It’s a shame that the same can’t be said of sister paper, the Lichfield Mercury. Gary Phelps may be doing a great job with the Herald but he has little to no time for the Mercury which, despite having a couple of passionate reporters, plays a distinct second fiddle to the Mercury and leaves Lichfeldians out in the cold. We have to settle for out of date news which we’ve already seen online and the paper isn’t even being delivered on time recently. There is Lichfield Live instead which is online but I think that’s just one guy and doesn’t have the depth you’d want from a good paper. I guess I meant catchy in the context of letters page headings, Pat! But point taken! The industry could learn a lot from what we have achieved without big group thinking. Chris Oakley, both our former boss, said he thinks the philosophy we have is the way ahead for newspapers.